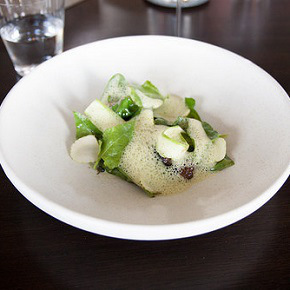 Matt Olrando introduced Copenhagen to a new type of restaurant. Focus on innovation, technical skills, very tasty food and an interior with a tremendous amount of personality. It is clear that Matt Orlando wanted to have fun with his project. He trough away the tight constraints of Noma, preserved his skills and now serves a menu that takes inspiration from his entire career at both Noma, Per See, The Fat Duck and off course his upbringing in San Diego. The personal style is clear and present in the interior: an old factory building, graffiti on the walls, an “urban garden” where you can enjoy your champagne and even herbs inside the restaurant. This is my personal favourite of the “relaxed fine dining restaurants”. Food that tastes exceptional, relaxed and a welcoming atmosphere offering a very unique experience.